In Southern California, we’ve been behaving like its summer. T-shirts, shorts and flip-flops with trips to the beach or lounging by the pool with cold beer or blended margaritas. Sure the nights and Pacific Ocean can be a little chilly, but we are moving forward with summer and Mother Nature isn’t too apologetic about it. While most of the country was chiseling the icicles off their underwear or buried under six feet of snow, much of California has been dry and parched. Despite the drought, our farmers markets are rich in produce of every shape and color. So while we are fortunate to have sweet melons in Los Angeles, yours maybe more than a few weeks away, but don’t worry because summer will be upon us all soon enough. In anticipation of your first ripe watermelon, here is the recipe for one of my favorite new salads. 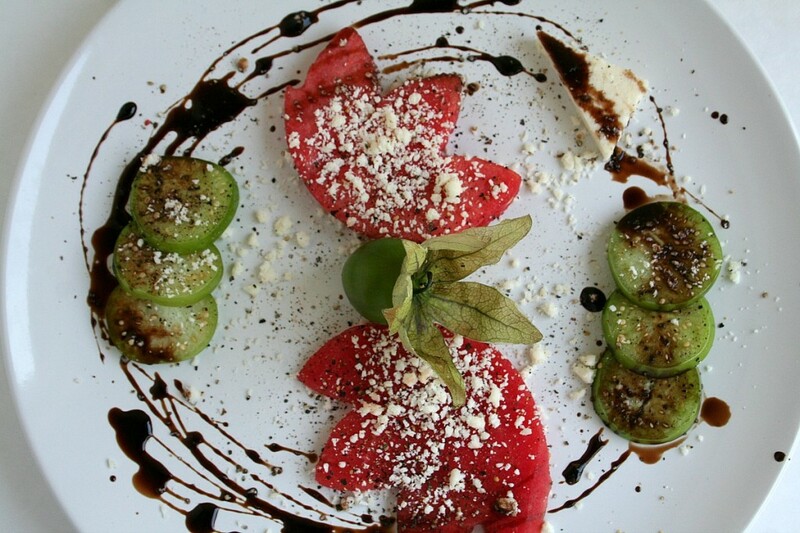 I’ve paired sweet watermelon with salty cheese and tangy balsamic vinegar. Not particularly groundbreaking, until you add raw tomatillos. The sweet-tart tomatillos echo with citrus and have a nice, clean snap when you pierce the skin, and yes, you can eat them raw. Tomatillos are usually roasted or boiled to make salsa. But raw is just as “rawsome.” Just remove the husk and wash them thoroughly to remove the sappy stickiness. Then slice them anyway you prefer: Bruschetta? Green salads? Crudité? So while you’re waiting for warmer weather and sweeter melons, just curl up with a hot cup of soup. Me, I’ll be eating some more watermelon and tomatillo salad. 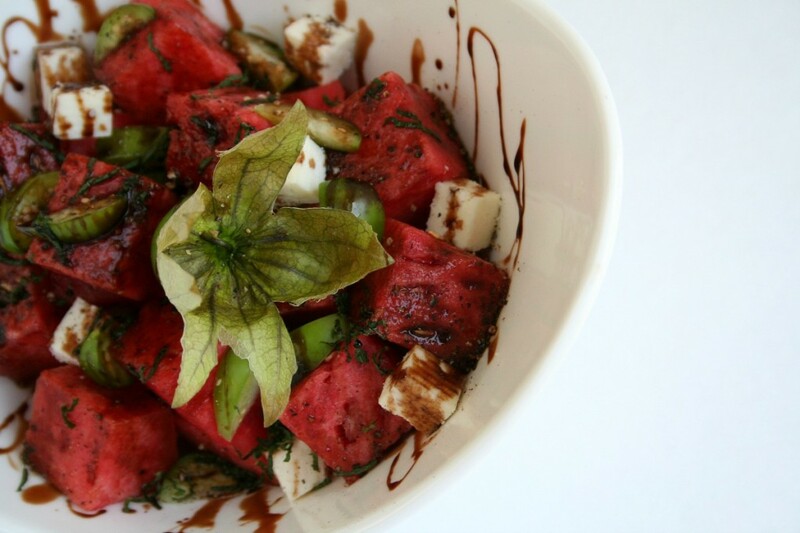 Gently toss the mint, watermelon and tomatillos in a large mixing bowl. Divide between 4 bowls. 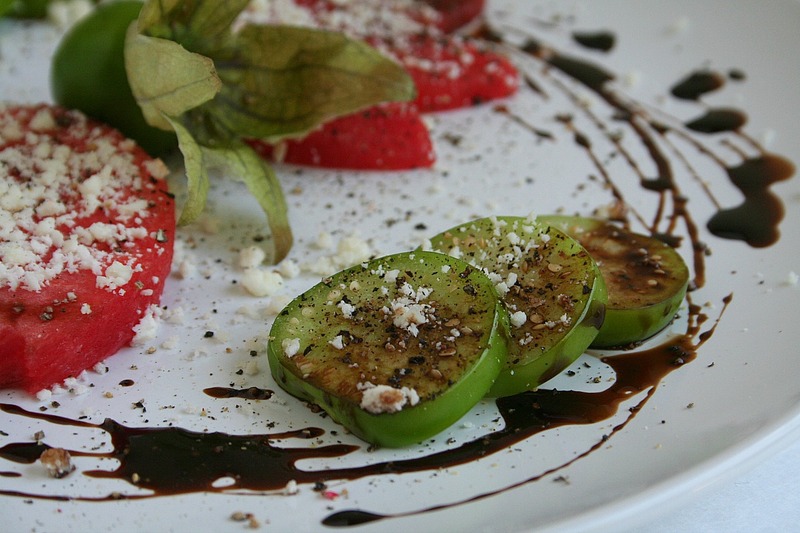 Season with salt (remember cotija is salty), pepper and drizzle with balsamic vinegar.